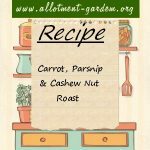 Recipe for Carrot, Parsnip and Cashew Nut Roast. The ingredients are enough for 6 hearty portions or half can be frozen uncooked for another day. Recipe for Curried Parsnip Soup. Perfect for those bitterly cold winter days when parsnips have had their first frost and are at their best. Recipe for Moroccan Vegetable One Pot. Sprinkle with mint and serve on its own or with couscous or crusty bread. A vegetarian taste of Arabia Serves 6. 5 A Day Curry Recipe - Thai Mixed Vegetable Curry. You can change the vegetables to suit your taste. Serve with boiled Basmati rice and Naan bread. Recipe for Gardeners' Chicken. Green salad contrasts well with this dish and if you feel extra hungry, serve with ciabatta bread (or similar). This easy flavour full recipe for Vegetable Broth is filling on its own but can be served with some (preferably buttered!) crusty bread. Serves 4. Recipe for Deep Fried Parsnip Sticks. Lovely as a side dish (if rather fattening!) or as an accompaniment to grilled chops or sausages. Recipe for deep fried Parsnip Balls. Can be served as a side dish or just eaten as a snack. Recipe for Savoury Vegetable Pie. Serves 4 as a side dish. If you like the flavour, celery salt makes an excellent seasoning for this dish. Recipe for Carrot and Parsnip Mash. A favourite with children of all ages and a good way to get two of their 'five a day' vegetables into them. Recipe for Roasted Parsnips with Irish Whiskey and Seed Mustard Glaze. Parsnips are a wonderful vegetable and this sophisticated recipe makes them special . Recipe for Curried Creamed Parsnip Crumble. A great recipe for a creamy parsnip crumble with a curry twist courtesy of Granny Dumplin.